Most people love potato chips, which are made out of potatoes fried in oil and sprinkled with salt. Chips are usually found as a side dish to sandwiches and picnic foods, or they are consumed by themselves as a snack. Lay's is one very popular brand of potato chips. It offers a variety of chips, all with differing levels of nutrition. It is important to read the nutritional labels of each type. Although potato chips are not generally known to be healthy, there have a positive side. Lay's Classic Potato Chips have no preservatives or additives. A 1 oz serving of these chips has no cholesterol, 1g fiber, 9 percent potassium and 10 percent vitamin C. They also have healthy polyunsaturated and monounsaturated fats, only 6 percent saturated fat and no trans fat. At 7 percent, the sodium is not that high either. The FDA explains that 5 percent or less of a nutrient is low, while 20 percent or more is considered high. 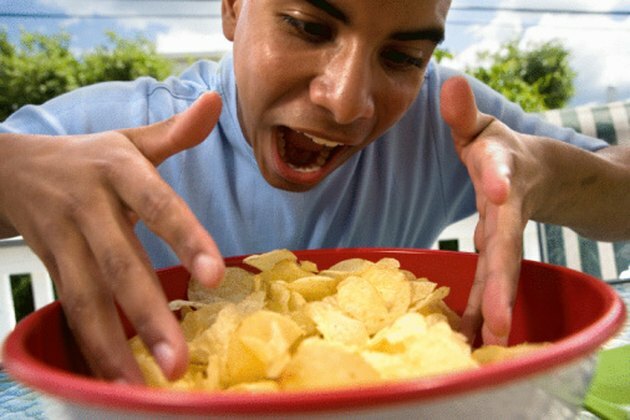 On the negative side, a 1 oz serving of Lay's classic chips has 150 calories. They also have 16 percent total fat, which is close to the high side, according to the FDA's recommendations. Although Lay's marketing tells customers to eat more than one, they might want to limit the number they actually eat. The ingredients of Classic Lay's chips are surprisingly simple. They only contain potatoes, sunflower or corn oil and salt. Lay's website claims that it has no additives and no preservatives, making this snack not as unhealthy as many other choices. Lay's offers many varieties of potato chips, including "Barbecue," "Cheddar & Sour Cream," and "Cajun Herb & Spice." Lay's offers a low sodium variety, with 4 percent sodium, and a light version with half the calories of regular Lay's and no fat. Lay's also has "Natural" potato chips which claim to be made with more natural ingredients and have sea salt. It also offers kettle-cooked potato chips and baked chips, which are baked instead of fried, for a healthier choice, according to the company website. Lay's "light" variety of chips have less fat and fewer calories, but they contain Olestra. Olestra has been controversial for a long time. In 2004, the Center for Science in the Public Interest warned that Olestra had returned to Lay's products in this variety, whose name was changed from the controversial WOW! variety of chips associated with Olestra side effects. The Center claims the FDA has been sent more than 20,000 reports of negative effects of Olestra, including diarrhea and cramps.